My quest for old orchid books in Melbourne’s used bookshops was rewarded a few years ago by the discovery of a copy of Davis and Steiner’s Philippine Orchids, published in 1952. 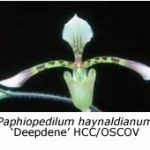 It gives detailed descriptions of various orchid habitats throughout the islands and describes over a hundred of the most horticulturally desirable species of the Philippines. More recently, however, it has been superseded by Jim Cootes’ The Orchids of the Philippines (Times Editions, Singapore, 2001), which describes over 300 species, each illustrated with a magnificent colour photograph by either David Banks or David Titmuss. The Philippine Archipelago comprises about seven thousand islands, stretching from approximately 5°N to 20°N, a distance of nearly 2000 Km. In equivalent terms of distance from the equator, these islands stretch from the Central Highlands of Papua New Guinea to Townsville. Consequently, virtually all orchids growing near sea level in the Philippines would require warm conditions with a minimum temperature of at least 15°C (preferably higher) in cultivation. However, many Philippine orchids grow in the mountains, which reach an altitude of almost 3000 m on the northern island of Luzon. Different species are found as one ascends these mountains. Some of the most desirable – Phalaenopsis amabilis, P. schilleriana, Vanda sanderiana (syn. Euanthe sanderiana) and Vanda luzonica are found between an elevation of 500 m and 1700 m. The moss forests begin at 2000 m and are home to “a multitude of inconspicuous or ‘botanical’ orchid species”, including the desirable Dendrobium victoriae-reginae, D. gonzalesii, D. amethystoglossum and many dendrochilums. We often read that, if we know the latitude and altitude where an orchid grows, we should be able to deduce what cultural conditions it needs. This is not necessarily so in the Philippines, where there are no less than four different climatic zones. Some areas have prolonged wet and dry seasons, others only a short dry season and yet others have no dry season at all. 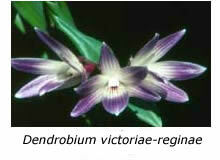 Arguably the most popular of the orchids of the Philippines with growers in Melbourne is Dendrobium victoriae-reginae. 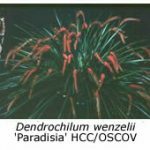 Most plants of this orchid were originally collected on Mount Santo Tomas (2500 m elevation) near Baguio in central Luzon, where the minimum temperature throughout the year averages 13 ± 2°C and the maximum temperature 24 ± 2°C. December to March is comparatively dry (less than 50 mm of rain per month) while May to October are very wet (over a metre of rain in both July and August). The lesson to learn here is that we should water our plants very heavily during summer. 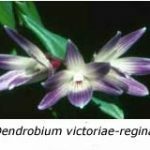 While Dendrobium victoriae-reginae can be grown without heat in Melbourne, we can see that it would probably do much better if maintained within a temperature range of 13 – 24°C. In fact it’s amazing that this orchid grows at all in a Melbourne shade house, where temperatures can fall close to freezing in winter and climb to over 35°C in summer. 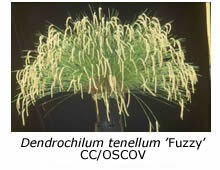 Some but not all dendrochilums grow in the same area as Dendrobium victoriae-reginae. 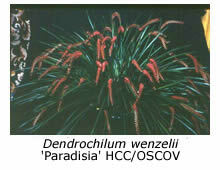 Dendrochilum cobbianum is found growing on cliff faces at altitudes between 1300 and 2200 m in the vicinity of Baguio and it may therefore perhaps grow without heat in Melbourne. 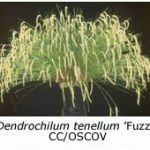 However, Dendrochilum filiforme is a lowland species found in forests on the east coast of Luzon and it therefore requires heat for satisfactory cultivation in Melbourne. 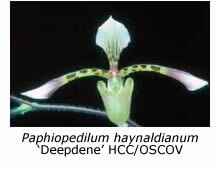 The popular Philippine slipper orchids, Paphiopedilum philippinensis and P. haynaldianum are low-altitude species. P. philippinensis is found on the island of Mindanao, which is quite close to the equator, while the more widespread P. haynaldianum grows only at altitudes below 1000 m. In nature these paphiopedilums seldom experience temperatures below 20°C, so if you are growing your plants at much lower temperatures, then you are probably not doing them full justice.